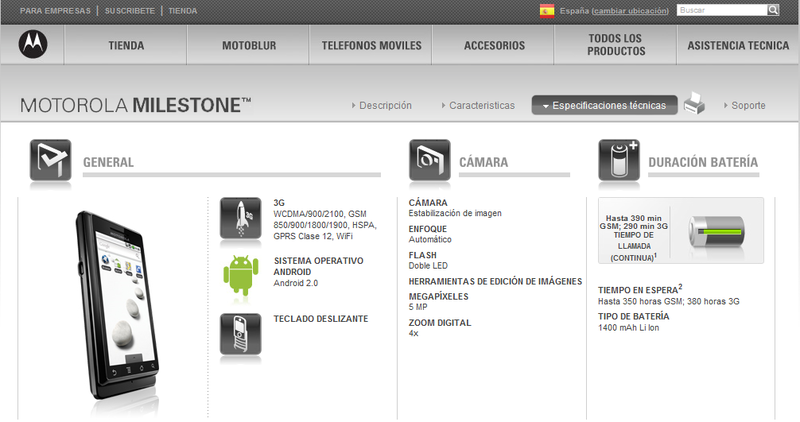 Last night, we noticed that the Spanish Motorola website was showing the Milestone as currently running Android 2.1 and Flash lite. This seemed a little odd, so we asked the Motorola forums manager, Matt, what his thoughts were on this breaking news. He has yet to answer almost 24 hours later. And what else? Oh the site has now been changed back to 2.0, but for some reason still shows Flash lite. This obviously isn’t the first time that Motorola has screwed up in a major way. We all still have fond memories of the week of February 8th which included the now famous Facebook message followed by some disappointing 2.1 release notes. How comical has this become? Welcome to the New Droid Life!